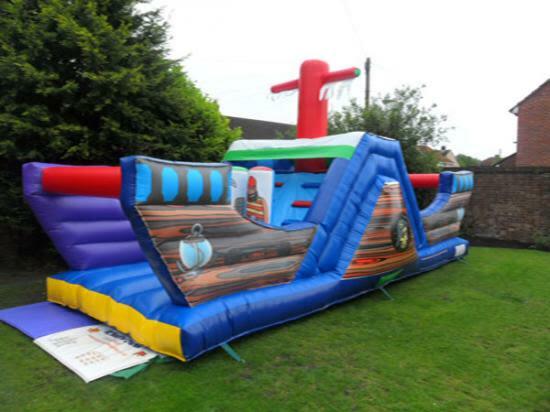 We’re sure you will love our bouncy castles for your events - but are you looking for something NEW? Something that no one has had before? If you said yes, then this brand new assault course might be what you’re looking for! With a Pirate Ship theme, it is perfect for kids and kids at heart. Safety should be no cause for concern, because the Pirate Ship comes with four safety mats. In addition, all electrical appliances used will have an RCD safety plug. Your kids will surely have a grand time playing and bouncing around with friends in this ship - and you don’t have to worry about their safety. However, we recommend a limit to the number of people boarding the ship to 10 - 12 at a time. 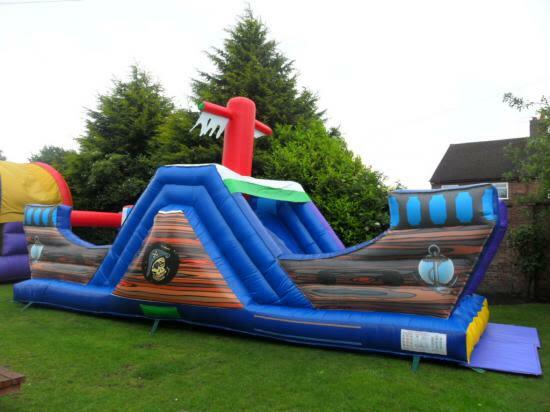 For just £110, your tykes can have a whole day of pirate fun! The ship is 32ft x 12ft, and requires an open space of 35ft x 15ft for installation. Our technicians will peg the assault course down at the back and at all sides. Some room will also be needed for the blower which will inflate the pirate ship. The good news is, we’ll take care of setting it all up, and taking it down when you’re finished with it. For more information about our assault courses, insurance policy, ordering process, or any concerns, call or email us. You can also reach us using the Contact form.